WHAT ARE THE MAIN ETHICAL AND QUALITY PROBLEMS WITH EHRs? WHY IS COPYING AND PASTING A PROBLEM? WHAT SHOULD NEUROLOGISTS USING EHRs DO? If authors did it, it would be called plagiarism; but, although the stakes are much higher, copying other people's words has become the norm for physicians, rather than the exception. As a February 2013 article in Critical Care Medicine found, 82 percent of all residents and 74 percent of all attending physician electronic health record (EHR) notes contained greater than or equal to 20 percent of copied information. Likewise, an earlier study in the Journal of the American Medical Association (JAMA) revealed that sign-out and progress notes were particularly redundant, with an average of 78 percent and 54 percent of information duplicated from previous documents, respectively. We've all seen examples and many of us have done it ourselves. It's certainly easier to “copy-and-paste” than to input new data elements such as lab or test results, re-interview a patient in order to record their review of systems, or take a new past medical history. It's also part of what has been pitched to us as the benefit of digitized health records — no wonder it's become so commonplace. But when copied information is outdated, inaccurate, or just too voluminous to be read, it can lead to serious medical errors, a term dubbed “e-iatrogenesis” to describe patient harm resulting from health information technology. The practice of “cloning notes” has also evoked concerns of billing and coding fraud, and has captured the attention of the Office of the Inspector General (OIG). Last October, the OIG announced that it plans to review documentation to see whether notes on the same patient are identical from visit to visit. Indeed, during the AAN Fall Regional Conference in Las Vegas last year, a neurologist told me he had been charged with “medical record cloning” and was under investigation. Neurology Today asked Dr. Bernat, a frequent contributor to the “Ask the Neuroethicist” column and a member of the Neurology Today editorial advisory board, to share his observations regarding the ethical challenges associated with electronic health records, and to highlight some of the emerging issues of concern. Copying and pasting information from other physicians' electronic notes, uncertainties when it comes to authorship, mutation of the note from a medical record to a bullet-counter, misleading histories and examinations, failure to review data that is “brought forward” from prior notes or “pre-populated” in the chart, inadvertent inclusion of templated information, and barriers to the physician-patient relationship, among others. The common sense definition of plagiarism is copying verbatim someone else's work without attribution. From an ethical perspective, if you are using someone else's work there should be attribution at a minimum. I see this as a different issue than copying portions of one's own prior progress notes. This should not be a problem if the notes have been edited accurately. COMPARED WITH PAPER CHARTS, THE TIME IT TAKES TO WRITE AN EHR NOTE IS OFTEN QUITE LONG. HOW DOES THAT IMPEDE QUALITY OF CARE? We all use the shortcuts available in EHR that are fine as long as they do not create inaccuracies. A 2012 article in JAMA called “John Lennon's elbow” discusses the quandary of notes being written with substantial delays between note initiation and note signatures and ensuing loss of clarity and timeline. Ordinary readers don't know who the original author was or when it was written because there was a “pending” status option and the note was not dated until the signature time. Some records don't make it clear who wrote what when, and who copied from whom, because of the ambiguities of dating. HOW DO NOTES THAT REQUIRE CO-SIGNATURES (LIKE THOSE FROM MEDICAL STUDENTS, HOUSE STAFF, OR PHYSICIAN EXTENDERS) CREATE A POTENTIAL PROBLEM? I'm not opposed to co-signing, but you are supposed to assume responsibility for the accuracy of the material when you do that. The problem is that you may not know who wrote it. This fact makes it even more critical that the attending physician or person with the signature on record ensures the accuracy of the information. IN THE NEUROLOGY ARTICLE, YOU NOTE THAT THE RISK OF USING TEMPLATE NOTES IS THAT THE INFORMATION AUTOMATICALLY DISPLAYED MAY NOT CONFORM TO WHAT WAS FOUND ON A GIVEN HISTORY OR EXAM. ALL OF US WHO USE EHRs RELY ON TEMPLATES. WHAT IS THE ALTERNATIVE? There's nothing inherently wrong with templates. I use ones that I designed myself in my own language. But if you use templated material, you must go through the edits and make corrections that relate to that particular patient. It's not the right answer until you've gone through that process. It would be easy for someone who has not performed a coordination or sensory exam, for example, to put those sections in. Those records which automatically insert templates as the default mode need careful scrutiny. YOU POINT OUT THAT ALTHOUGH PREPOPULATED EHR DATA SAVE TIME, THE PROGRAMMED INSERTION OF DATA SUCH AS RELEVANT LABORATORY OR IMAGING REPORTS DOES NOT GUARANTEE THAT THE CLINICIAN HAS CONSIDERED THE RESULTS, OR EVEN READ THOSE DATA. WHAT'S THE RISK? The risk was actually illustrated by a case presented at our Morbidity & Mortality conference. The attending was chagrined to hear that in his note was a wildly abnormal liver function test result on the day of discharge. He hadn't looked at it, so he didn't comment upon it. You have got to read the pre-populated data. Not reading entered data is something that couldn't happen in a paper record. SOME EHRs INCLUDE A FEATURE BY WHICH ENTERING A SYMPTOM, SUCH AS A CHIEF COMPLAINT, EXPLODES OPEN A GRID OF CHECKBOXES THAT CUES USERS TO RESPOND TO A SERIES OF RELATED QUESTIONS AND CONVERTS THE DATA ELEMENT ANSWERS INTO FULL TEXT. YOU CALL THE RESULT A “PSEUDO-HISTORY” AND IN THE CASE OF THE EXAM, A “PSEUDO-PHYSICAL.” WHAT ARE YOUR CONCERNS WITH THE CONVERSION PROCESS? It gives the impression that the resulting text transcribes the exact words patients used to describe their symptoms, for example. But, they are not their exact words because they've been data processed. It looks like a proper history but it may not be quite accurate. We will often edit what patients say even in our own histories, but this type of editing is machine-editing into pre-programmed phrases, so it can mislead readers. The technology also makes assumptions that may lead to errors. For instance, a nurse may enter the chief complaint as “heartburn.” The feature then generates a list of questions, drawing a conclusion from a symptom before you've in fact reached that conclusion. I don't know how frequently this happens, and it's just a theory, but the potential for misguidance is there. MEDICAL RECORDS HAVE EVOLVED FROM A DOCUMENTATION AND COMMUNICATION TOOL TO A MORE COMPLEX BEAST THAT NOW RECORDS AND MONITORS MEANINGFUL USE CRITERIA AND SERVES AS THE FOUNDATION FOR BILLING AND REIMBURSEMENT FROM INSURERS. HOW HAS THAT USURPED ITS ORIGINAL PURPOSE? The patient record has been transformed from a platform to record a medical visit to a bullet counter. The main issue is that it subverts the note toward the inclusion of inconsequential or irrelevant information in order to secure a certain billing code or to achieve meaningful use. Furthermore, the time that it takes away from patient care is now no longer available for counseling and other appropriate services. Because of arcane rules that the doctor has to follow in order to justify billing, etc., the purpose of the medical record has mutated from documenting a medical encounter to a billing tool. As a result, the reader has a hard time knowing what's going on. It's a distraction and it's time-consuming and it contaminates the note. It's a perversion of the human response to a set of rules that are not necessarily in the best interests of our patients. All of us are goaded and incented to do this, and threatened with the consequences of failure. It's a sad evolution. We need to work with payers to reform reimbursement rules that harm the physician-patient relationship. We all have had the experience of reading overly long EHR notes that do not communicate effectively. Being on the receiving end and trying to figure out what actually took place during the visit is frustrating. Some people address this by writing a separate note or letter telling you what they actually think. We need to push ourselves as clinicians to be very careful, honest, and even meticulous in terms of the accuracy of a record. The shortcuts can save valuable time but should not introduce harm. We need to be vigilant not to let a good feature tempt us to go wrong. Dr. Avitzur, a neurologist in private practice in Tarrytown, NY, holds academic appointments at Yale University School of Medicine and New York Medical College. She is an associate editor of Neurology Today and chair of the AAN Practice Management and Technology Subcommittee. •. Bernat JL.Ethical and quality pitfalls in electronic health records. Neurology 2013:80:1057–1061. •. Thornton JD, Schold JD, Venkateshaiah L, Lander B.Prevalence of copied information by attendings and residents in critical care progress notes. Crit Care Med 2013;41(2):382–8. •. Wren JO, Stein DM, Bakken S, Stetson PD.Quantifying clinical narrative redundancy in an electronic health record. J Am Med Inform Assoc 2010; 17(1):49–53. •. Hirschtick RE.John Lennon's elbow. JAMA 2012;308(5):463–464. 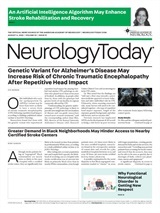 Neurology Today13(7):27-28, April 4, 2013.